Over a large sample size, Corsi is one of the best measurements we have at the moment for team-level skill. While it’s far from perfect, once you get 20 or 30 games into the season it does a pretty good job of predicting future goal scoring, and it’s a pretty stable stat, less affected by randomness than most others. At the moment the Leafs are 12th in the NHL in score-adjusted Corsi with 52%. In fact, they’re just .1% out of the top 10, so the Leafs are playing like a top 10 team in terms of shot attempts this season. That suggests the Leafs have been playing well at even strength this season. 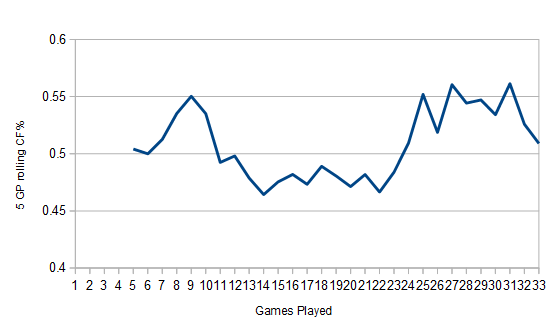 While the Leafs overall number has been good, as you can see, the results have gone through two peaks and one valley. While Toronto did a great job of out-shooting their opponents early on in the season, they went through a protracted period where they were pretty consistently getting outshot. Then over the past 1/3 of the games they’ve played so far they’re doing fantastic (55% Corsi would be tops in the league). There are lots of possible explanations for the results we’re seeing here. Maybe the Leafs made some lineup changes or shifted the ice time distribution towards less talented players. Maybe a team with quite a few rookies is still learning to find consistency. Maybe it’s just randomness. In truth, it’s probably a combination of several things, but there’s one explanation that I think covers a lot of it. The trend here is unmistakable. When the Leafs are playing average or below average teams, they perform quite well. When they face the top teams in the league, the results are not as good. This is exactly what I’d expect from a team in the Leafs’ position. They’re a good team, which is why their results are solid against a majority of the league, but they’re not yet a great team, which is why they struggle against the best of the best. In the long run I think Toronto’s overall Corsi results are a fair reflection of their talent, but in the short run a lot of things can impact results, and quality of competition is a big one. I can’t wait until jeffler shows in part 2 how 100% of the drop in corsi is due to Hunlak. Is it a coincidence that an article about how important Corsi is, features a picture of Polak? The Hunlak conspiracy lives! Anyone who expected the team to jump from last years abysmal numbers to a top Corsi team every game was dreaming. Considering this is truly year 1 of the build, the success is phenomenal and everyone involved from Shanny, Hunter, Dubas, Lamoriello and Pridham to Babcock, his entire coaching staff and the talent that has been brought into the dressing room. Not arguing your point, I agree with you on where the Leafs are, but the Corsi numbers from last season were far from abysmal. True Stan, I should have clarified that I was discussing more than just corsi last year when I referred to ‘abysmal numbers’. And people pointed out the lack of finishing ability to be a large part of the results. Which we added this year with Nylander, Matthews and Marner to name a few. According to this article our Corsi is almost top 10. According the the standings we are tied for 7th worst team in the League. How can this be? This year we have lost a lot of games where we had the best Corsi. We have won a lot of games where we had the best Corsi. 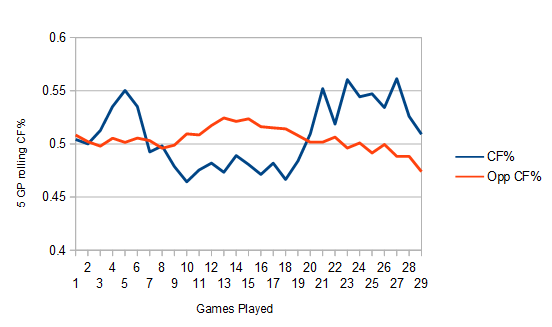 We have lost games where we had the worst Corsi. We have won games where we had the worst Corsi. How the does Corsi predict the future success of any team? Why do so many fans feel Corsi is the Holy Grail for hockey. It predicts winners of games at about the same rate as a coin toss. I didn’t check the stats but I think it is close to 50%. That tells me Corsi is meaningless. Look at the playoffs. It’s year to year predicting 12-15 teams, which is better than a coin toss to me. There’s always going to be outliers, good teams getting left out and bad team(s) getting in (Colorado, Calgary, 12-13 Leafs..). As I recall it’s somewhere in the 70-80 percent range as predictor, which is still way better than tossing a coin, or the “experts” on TV/online. I’m betting the results are going to be better the latter half. You could do the work and see individual games’ results, take away OT-losses/wins, and shootouts. I’d be willing to bet it would be more than 50%. Toronto is 5 points behind Boston for third in the Atlantic. Toronto now has 4 haves in hand on Boston. Florida (we have one game in hand) and Tampa Bay (we have 2 games in hand) stand in our road. Florida is next up tomorrow night. Tampa Bay the very next night. Corsi s an indicator..thats all. As a team Stat it is weak. As an individual Stat it’s Damm near useless. There are usually 9 other players in some way contributing to the shot. For goodness sake a flip in or icing attempt that hits the goal is included. It’s the shot that crosses the goal line that is important.